My last BLOG post addressed the rich history at the UC Hopland Research & Extension Center. Part of that intriguing history involves the old family parcel ownerships and homesteaders from the 1800s and the early 1900s. One of those family ownerships was the Vassar family ranch which was a working sheep ranch at the time. Several of HREC's fenced pasture units are named after them ... "Vassar Pasture", East Vassar Pasture", and "West Vassar Pasture". 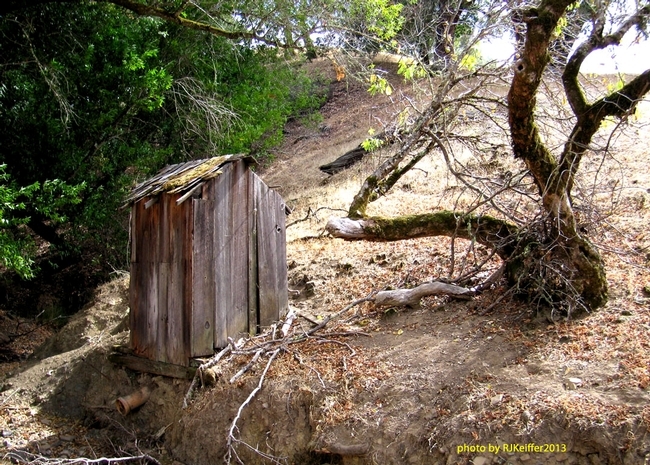 Of course back in the early 1900's a plumbed bathroom was rather unheard of in rural places... and fitting for the times was the family outhouse ... a fancy two-holer with an easy clean-out pipe exiting to the adjacent seasonal creek. This gives a whole new meaning to the phrase "nutrient rich waters".